Dolpas and eyes and birthdays, oh my! Regarding this post I am going to try preordering from one of Volks’ new fangled authorized US dealers: Rochelle at Kerbey Lane Doll Shop [post here]. No guarantees, but at least I’m on a list for that swimsuit, and no CA tax if I get it (not such a big deal on smaller items, but still). I’ve bought stuff from her back in the olden days and she was super nice, both my Pirate Sylvie outfit and The US Convention outfit designed by Nat came from her, at totally reasonable prices etc. I will report back my findings! So far it seems really similar to how it worked with Frank. You just kind of point and say “I want that, the white one w/ blue trim” and they say “alright, you’re on the list if we get enough! 20% deposit on all dolls!” etc etc. I also finally sat down and just ORDERED SOME EYES from Blanki. 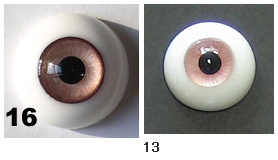 16mm regular for Lysander & 12mm pale pink Sweety Eyes for St. Trinian. Poor Trinian! She had lovely little cobalts from KanisAugen and Merry stole them. I need to get some pale blue tallinas (which is why she’s getting the pink from Enchanted). I’m totally in an eye rut. I have the hugest collection of pink eyes evar, mostly pale. And if I could have zoukie thin blue eyes for all my dolls I’d do it in a heartbeat :/ Hence Lysander is getting the (what I hope will be) deep rusty mauve. Though I really need to try him in light blue, or something bright, as the mauves and purples I’ve had him in don’t contrast with his bruised little face-up. I’m geeking out this morning. Next Next post: Birthday loot!